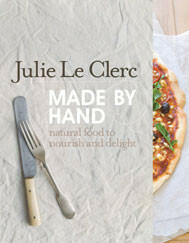 Made by Hand is bursting with recipes that use fresh, natural and easy-to-find ingredients. The concept behind these recipes is to help home cooks find healthier ways to enjoy their favourite foods without losing anything along the way. ‘This book is all about flavour, not sacrifice. Just because the food I am suggesting is natural, wholesome, light or gluten-free, does not mean it’s boring or tasteless. . .This book is about having your cake and eating it too. . . Food made by hand from natural ingredients definitely tastes superior. Also conscious of the bigger picture, Julie shares some of her natural lifestyle tips in break-out sections: The Natural Pantry; Start a Kitchen Garden; Shop Smart, Recycle, Reuse; Be Organic-Savvy; The Good Oil; and Eco Cleaning.